My name is Mona Elston and I am ready to have my horse nerved this Tuesday. After a year of “corrective” or “therapeutic” shoeing, my horse is still lame. The thought of nerving him makes me sick to my stomach (especially after I read your article “Bringing the Sparkle Back in Crystal’s Life”. My reason for nerving him is to get him out of pain and give him some quality of life– I have another horse I can ride. I am just tired of seeing him in pain. I bought him when he was 5 ½, he is now 7 and he was lame 30 days after I bought him. I suspect they gave him a “30 day” injection in the bursa before they dumped him because the x-rays showed that the navicular disease had been there for some time. I don’t have horse property so I have to board him so I am trying to do the best that I can do for him. Is there any way I can call you for a phone consultation and if so, what is your fee? I am at my wit’s end. There's an awful lot of information out there for you to read and explore. 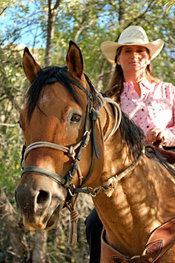 As you've discovered, the surgery is simply a "cover up" for your horse's real problems. You'll need to find someone in your area that is familiar with natural hoof care and can help you with getting some hoof boots. Or, you can simply get some boots yourself as a very good start. By exercising your horse in boots with the metal shoes pulled off, you may very well notice improvement immediately. 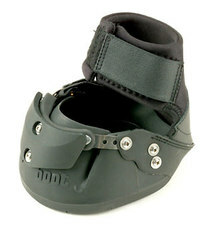 Visit EasyCare's website to look at the various boots available. Either the "Epic" boots or the "Old Mac" boots would likely work well for you. Read Pete Ramey's website if you haven't already, as well as continue to do computer searches and find other sites that have good information. Many sites have lists of trimmers by region. Do a search for "natural hoof care trimmer" to find some of these- Click here is a to see a good one. You're on the right track. Keep up your research. Get some boots BEFORE pulling the shoes- then get the horse's shoes pulled off. Do NOT have the horse trimmed at this time. Walk/ride your horse with the boots on and you'll likely notice improvement very quickly, as metal shoes are not only painful for a horse but PREVENT healing instead of helping like many professionals will tell you. Thank you very very much. I have canceled the nerving and I will try pulling Ziggy’s shoes and putting on the Old Macs and find a certified barefoot trimmer. It can’t do any more harm and if nothing else, I am hoping it will help. Nerving is definitely not the answer. Thank God I found your website and learned more about the nerving procedure. It sounds like I dodged a bullet. Good for you, Mona. I believe you'll have good success, and learn some very cool things over the next few months. Knowledge is empowering and you and your horses will be better for it. We are intertwined, heart, mind and soul with these animals. They perform for us with a work ethic rarely seen in human circles, and become capable of so much more when we allow their feet to function properly. Click here to read the rest of this article by Dr. Teskey. What Point Do you Recommend Booting Behind? Hi, I have just started doing LD 30 endurance rides with my six year old paint who has always been barefoot. I boot him in the front, Easyboot Epics or Easyboot Bares and leave him bare behind for the rides. I only boot him at home if we're going to be doing a lot of trotting on dirt roads. He does still get ouchy on gravel. At what point would you recommend booting behind? I would like to do a fifty at some point but am concerned that's too far without hind boots. We live and ride mostly in New England. Can I use an Epic or Bare behind or is it best to foam a boot on so there is no gaiter? Thanks for any suggestions. In your sport, and with most every other horse, the hind hooves work harder than the front hooves. Why is it, then, that we find ourselves having to boot the front hooves instead of the hind hooves? Seems like this is opposite of what we would think or what we “expect”! We use boots more often on our horses’ front hooves because our horses have more problems up front, not behind. Their hind hooves are stronger and sounder because they work harder. Front hooves “need” boots because they are not as sound as the hind hooves. This is the bottom line: front hooves are more unsound in our horses because of lack of movement/work throughout their lives. Even the smaller amount of movement our horses achieve in confinement allows their hind hooves to become stronger and healthier because they work harder than the front ones. And the ironic part of all of this is that when we shoe just the front hooves, we make the problems up front even worse. Using boots excessively up front can also lead to problems—taking time to ride more on surfaces that are comfortable for your horse without using boots is better than riding on rugged areas that require their use. If you can ride on really rough terrain without boots on the hind hooves, your horse has exceptional hind hooves. Now you just need to strive to improve the problems up front and ride more on those surfaces that are comfortable so that the front hooves become more callused and tougher and healthier. That being said, I would always protect those weaker front hooves with boots on gravel and rocky terrain, so you don’t add insult to injury. Hoof rehab is a long term and life-long endeavor for many of our horses that haven’t had proper room to grow up with. Allowing young horses freedom of movement from birth is the only way to go in the future. Soundness is rarely a problem in such horses that have been raised correctly from the day they were born. That’s the best insurance a horse can get. So, where does this leave you and others with the horses and your sports? First of all, we need to constantly strive to improve our horses’ living areas to maximize the mileage they put on every day. Many of us ride every day, but what about every NIGHT? Horses will put on a huge amount of movement at night if given a chance, but not if they are “put up” in the stable or stall or left in small turnouts or runs. They must be allowed to be in at least arena-sized areas WITH OTHER HORSES whenever we aren’t riding/training. If a horse is raised appropriately, they will more likely need boots on their hind hooves instead of their front hooves on rough terrain. How many horses do you know where this is the case? The only ones I’ve seen are ones raised on rough terrain from the day they were born as well as the young adopted mustang horses that aren’t confined once they reach their new home. When you do have to consider booting the hind hooves, all the normal considerations apply: proper sizing is the key, and the Epics or Bares will do just fine. There are lots of tips and tricks for fitting on the EasyCare website and on the other blogs on the site. That’s a bit long-winded for me in answering your questions, but I think it’s important for all of us to get to the deeper causes of some of these common problems and start to think about things from the horse’s point of view. on each of them as if they're rubbing). Another thing is that on her right hind hoof (when looking at the horse face to face) it doesn't have much heel, so when the Farrier nails the shoe there's an open area and the heel is on the "air". My son rides her two or three times a week on pavement (yes, we're allowed here) and it wears the shoe on that hoof in about two weeks. usually hose her off starting from the legs up to cool her before taking her to the stall. When we finished hosing her off she starting limping from both her front hooves in a real bad way. We administer anti-inflammatory shots for a couple of days, pulled the shoes off her front hooves, and waited a month. After that she was shod again and everything was fine again until this last Monday when my son was riding her and they were coming in into the barn. She started to limp from one of the front left hooves. I've asked different farriers and each one will give me his own idea of what they think the problem is. And lastly, I can't find corrective hoof trimming farriers in my area and would like to learn to do it myself if possible . Sorry for the long e-mail I just wanted to describe my mare's situation the best I could because I need someone knowledgeable to give me a direction. Do a quick search on the computer for "barefoot horse trimming" and you'll get a lot of information. You'll need to find someone in your area to help guide you if possible. Also it would be good for you to get a pair of hoof boots for those front hooves. After you read some more stuff, get back with me with more questions if you need to. What is the greatest difference you see in the barefoot ‘movement’ of today compared to when you first started? Do you see the trend growing in popularity and if so, why? What’s changed in our horse society that is making it more receptive now? Click here to read Dr. Teskey's answer to that question and more! If you have a question for Dr. Tom you can email him or post a comment here and he will respond as soon as he can. I am looking to find out what is the best boot to start with. I live in Florida and am a trail rider. My horse is a TWH mix (smile). I think she has some draft in there somewhere. She is 20. The only real problem I have had is thrush, she is very prone (if you have info on that I would take it, I have tried everything under the sun). I currently have her barefoot and would love to keep it that way. She had shoes in the past. My main problem with her new found barefoot freedom is she keeps developing a split in her front left. The farrier has told me not to worry "yet." I am not good with the looming danger, and then I don't ride, so I was thinking boots may be an answer. No one I know uses them here, shoes on dang near everyone!!! I am just a backyard pet owner so money is a factor. I need to see if the boots last long, and are worth the investment. Will the boot provide the extra integrity that a shoe would so I no longer have the threat of the split? What style would be best for me? I am looking to do something asap, I will await your reply. Give those new G2 Old Mac boots a try. For someone just starting out with this, they will work very well for you.You can see them at EasyCare, Inc. and they have the sizing charts all right there. They are a great investment because they outlast shoes at least 10 to 1, and of course they don't damage your horse like steel shoes do. Boots offer the best, most honest protection you can buy. Shoes are a "band-aid" at best and the problems only persist and/or get worse in the long run. If the split in the hoof doesn't resolve, it's an indication of imbalance and/or infection in the hoof. EasyCare is going to give away a free pair of their new Custom Easyboots in this blog contest. In order to enter, send an email to Karen with the name of the horse owner and the boot name that won the EasyCare December testimonial contest. You can submit your entries for the next week, up until January 16, 2007. The name of one lucky winner will be drawn from all of the correct entries to receive a free pair of Custom Easyboots. Valued at over $150.00 you don't want to miss your opportunity to have boots made with your choice of options. You'll be able to choose tread pattern, heelstrap and type of buckle. Good luck!